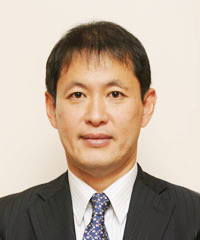 Komatsu Hideki (小松英樹, b. 4 March 1967) is a Japanese professional 9-dan born in Aichi, Japan. He is known for his quick rise in the 80s, string of minor title wins in the late 80s to early 90s, and for being involved in the first eternal life position in an official professional game. He is a member of the Nihon Ki-in. 1987: Winner of the 5-dan section of the 12th Kisei. 1989: Winner of the 6-dan section of the 14th Kisei. 1993: Progressed into the 49th Honinbo league. 1997: Runner-up in the 6th Ryusei. 2005: Progressed into the 30th Kisei league. 2008: Achieved his 700th career win. 2013: Progressed into the 18th Samsung Cup main tournament. The first eternal life position in an official pro game took place between Komatsu Hideki (White) and Rin Kaiho during the 48th Honinbo League on 18 March 1993. Komatsu was considered the main rival of Yoda Norimoto for several years.